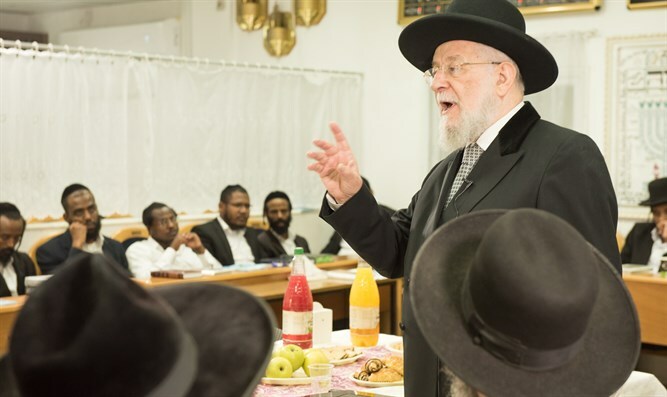 Former chief rabbi visits new yeshiva founded to prepare young Ethiopian Torah scholars for rabbinic ordination..
Former Ashkenazic Chief Rabbi and Tel Aviv Chief Rabbi Yisrael Meir Lau, together with Petah Tikva Chief Rabbi and Ateret Nehemia Yeshiva Dean Micha Halevi attended the one-year celebration of a new Ethiopian yeshiva. The new yeshiva was founded by Rabbi Yehuda Salah of Tel Aviv's Ethiopian community, for the purpose of providing ordination for young Ethiopian rabbis. As part of their program, the yeshiva's students participate in local community activities, gaining experience necessary for their future as community rabbis. During his visit, Rabbi Lau spoke emotionally about the self-sacrifice Ethiopia's Jews had made for Israel and Jerusalem, describing the enormous challenges he confronted in his struggle to advance and integrate Ethiopian rabbis into the Jewish world and the Rabbinate. Rabbi Lau also expressed his appreciation for the yeshiva's students, who had taken upon themselves the responsibility of being tomorrow's rabbis. "Students who are sitting and learning Torah here have the outstanding ability to serve as a linchpin for the entire community - from the youth to the elderly - and connect them to tradition and Judaism," Rabbi Halevi said. Rabbi Salah thanked Rabbi Lau for his efforts to integrate Ethiopian rabbis into the Rabbinate, and for the help he had personally received during his work in the Tel Aviv rabbinate. "The mass emigration from Ethiopia to Israel was an enormous thing," Rabbi Salah said. "But in order for our happiness in Israel to be complete, we need not only to immigrate to Israel, but also to continue our upward mobility in the country." "This was the reason we founded our yeshiva." The new yeshiva is part of a project called "Olim Lehatzlacha" (literally - ascending/immigrating to success), and receives aid from the hesder yeshiva in Jaffa. It is run by Rabbi Salah in coordination with several organizations which aim to help immigrants from other countries integrate into Israeli society.